People will never guess how easy it was for you to build this magnificent project. He is made primarily from one 8 ft. length of "2 x 10" and two 6 ft. lengths of "1 x 10". Santa holds a lantern with frosted flame tip light bulb. Our 3/4" pre-drilled wood balls are used for the holly berries on his coat. All parts drawn FULL SIZE. 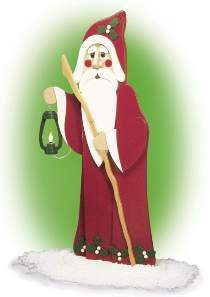 Santa stands 57"H. Lantern Santa Hardware Parts Package includes 6 ft. wiring harness, frosted flame-tip bulb, brown plastic eyes, pre-drilled wood balls and dowel pin stock. Project plan, remaining wood and paint not included. Save with the #1095 Special which includes the #W2113 Plan and the #1094 Hardware.